Louise is a Chartered Planning and Development Surveyor and a Chartered Planner with considerable experience drawn from the public and private sectors within the UK and overseas over the past 30 years. She provides development and planning advice to the commercial, industrial and residential sectors, academia, local authorities and charitable bodies and Government departments. Louise has been a retained advisor to the Home Office, a visiting lecturer at Birmingham City University and is a Visiting Fellow of Sheffield Hallam University. She was awarded an Honorary Doctorate of Technology by Wolverhampton University in 2013. 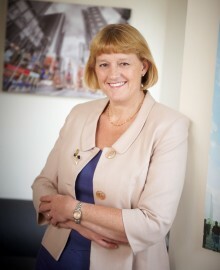 She was appointed Global President of the Royal Institution of Chartered Surveyors in July 2014, the first woman to be appointed to the role and has served on the RICS International Governing Council, and Regional Board for a number of years. Louise was a Vice Chair of the National Planning Forum and a previous Chairwoman of the WoW organisation and in 2014 was shortlisted as the CBI First Woman in the Built Environment. Louise is regularly asked to speak at national and international planning and property conferences, is a strong advocate for diversity and the advancement of women in business and is a well respected contributor to professional journals, nation TV and the press.